Coincidentally, today is UNESCO World Day for Audiovisual Heritage, a day to celebrate the cultural significance of recorded sound and video and to raise awareness of the urgent need for its preservation. Visit the Coordinating Council of Audio-Visual Archives Associations for a list of events planned by archives and heritage collections around the world. A new finding aid from the Archive of World Music provides the opportunity to explore and listen to music and sung poetry from northeastern Iran. The Stephen Blum Collection of Music from Iranian Khorāsān at Harvard University: original ethnographic sound recordings, 1968-2006 contains audio from ethnomusicological fieldwork conducted in the northern part of Iranian Khorāsān. Included are about 50 hours of field recordings made in 1968-1969 and 1972, with an emphasis on sung poetry in three languages: Persian (Farsi), Khorasani Turkish (Torki), and Kurmanji Kurdish. 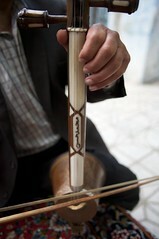 Musical genres in the collection include both lyric songs (chārbeiti, ghazal, and gharibi) and narrative pieces (naqqāli, dāstān, and others), performed as solos or accompanied on instruments such as the ney, a kind of flute, the kamānche, and the dotār, both types of lutes. The performers are the subjects of Blum’s Ph.D. dissertation, Musics in Contact: The Cultivation of Oral Repertoires in Meshhed, Iran. In this representative recording from the collection, made in the city of Mashhad in 1969, the naqqāl Heidari – a solo singer – performs an excerpt from Firdawsī’s 11th century verse epic, Shāhnāmah, the Book of Kings: Haft khwān-e Rustam (Seven exploits of Rostam). The hero Rostam, accompanied by his horse Rakhsh, battles monsters, demons, sorcerers, and temptation, in order to release the king Kai Kavus and his army from captivity. Dr. Blum has been deeply engaged in the scholarly exploration of Iranian musical culture since the late 1960s, and he completed his doctoral studies under the direction of Bruno Nettl, a leading ethnomusicologist. Blum has also been instrumental in the field, not only with his scholarly work but as the founder of the ethnomusicology concentration at the City University of New York Graduate Center, where he has taught since 1987. Among his many publications are chapters on Central Asia and Iran in The New Grove Dictionary of Music and Musicians and The Garland Encyclopedia of World Music. Following the Revolution of 1979, Dr. Blum was unable to return to Iran until 1995, when he donated copies of his earlier recordings to the Ministry of Culture and Islamic Guidance and made additional recordings in Khorāsān as well as in the city of Qazvin, northwest of Tehran. He began to make more frequent visits in 2006, and remains in close contact with Iranian students and colleagues. Recordings from these visits consist largely of conversations, with occasional performances, which are being digitized for future inclusion in the finding aid. The collection also includes notebooks and printed collections of verses intended for singing, along with a street guide to the city of Mashhad. Earlier this fall, Dr. Blum visited Prof. Richard K. Wolf’s seminar on classical Iranian music and its relationship to poetry and narrative in vernacular traditions, and used performances from the collection to illustrate these relationships.